A couple of weeks ago, fellow blogger, Karen Addison flew 5,500 miles from Johannesburg in South Africa with her bike to ride with me. OK, so she didn't fly over with her bike just to ride with me but we'd arranged to do this many months ago as I knew she was coming over in August. At first I'd offered to let her use one of my bikes but as she plans on moving over to the UK in the not too distant future. Karen arrived at my house at 10am and we had a long old chat about life and cycling. We then set off for a short but hilly ride to Beachy Head. 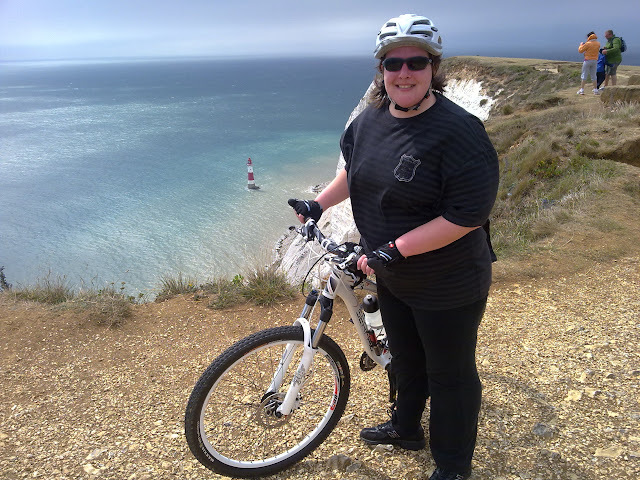 I'd planned the ride to Beachy Head as there's only one long climb and the most stunning view at the top. There's also a pub at the top so we could stop for lunch. Karen found the climb quite tough but the bonus of going up is that you get to come down. Fast! Karen felt that she was too slow for me and I was holding her up but riding is more than just how fast you can get from A to B. If you are riding with someone it's all about the company. I ride so many miles by myself that it's great when you have someone to ride with. Whats her blog called mate? She's not blogging any more.